He and the Nashville Predators announced Wednesday that the veteran centre is coming out of retirement for his 18th NHL season as they try to win the Stanley Cup. 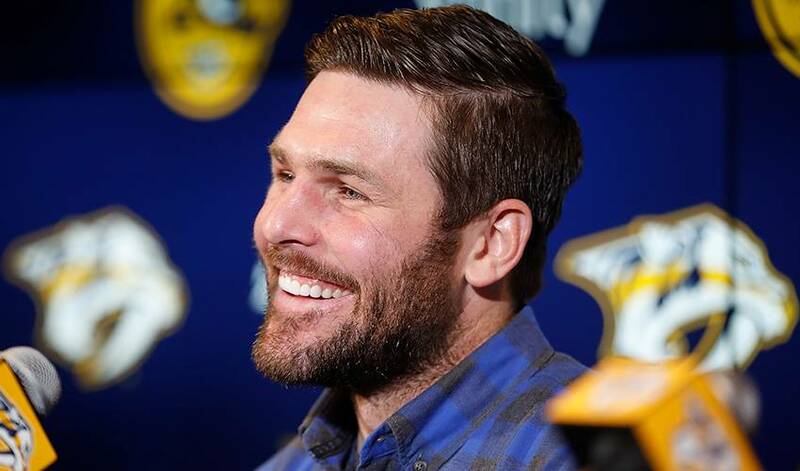 NASHVILLE — Mike Fisher insists he never thought of returning to the NHL and that watching players come out of retirement always bugged him. Fisher can add his name to that list. "I believe this team is built to win and has a very good chance, so that is part of the reason why I want to come back and compete and be a part of it," Fisher said. "But we didn't win last year, and it was the best time in my career and we didn't win. So I believe that this year can be our year, and that's why I want to be a part of and have some fun." Fisher started skating Wednesday and will spend the next few weeks working himself into shape to rejoin the team. Fisher has not signed a contract yet, and general manager David Poile said they will sign Fisher officially at some point before the Feb. 26 trade deadline for the stretch run in what he called one of his better moves. Poile believes Fisher has some unfinished business and wants to help the Predators win two more games than they did last year when they lost the Stanley Cup Final in six games to Pittsburgh . The current leadership with defenceman Roman Josi as captain will not change. "All this is really for getting ready for the playoffs," Poile said. The Predators ranked second in the Central Division after Tuesday night's games with 65 points, putting them three points behind Winnipeg for first. But Nashville has three games in hand on the Jets chasing the franchise's first division title. The Predators also rank fifth overall in the NHL. Defenceman P.K. Subban said he is excited to have Fisher back after welcoming the defenceman into the locker room after being traded to Nashville. Subban also expects a quick transition for Fisher once he joins the team. "He knows our system, he knows everything," Subban said. "I think that's the thing. When you go and get someone from somewhere else, it's tough. There's an adjustment period. You got to come in and learn our system. ... He's been playing under Lavi (coach Peter Laviolette) for a few years, knows our system. It's just a matter of getting back in skating shape and stuff." Nashville wanted Fisher back last summer. But Fisher, 37, announced his retirement Aug. 3. Fisher had 18 goals and 24 assists last season as Nashville earned its first Western Conference title. He's also husband to country star Carrie Underwood, and they have a son together. Coach Peter Laviolette said the locker room door remained open to Fisher for practices and games. The Predators started talking in December about what they might need with a possible return by Fisher at the top of the possibilities. Fisher, who had a hunting show last fall and was building a house, said he started talking with his family about a potential return. Fisher said his wife kept asking him almost every day what he was going to do. "She wanted me to do it," Fisher said of playing again. "She's usually right." Fisher has 51 points in 134 career playoff games. He played in 20 of the Predators' 22 post-season games last spring in winning their first Western Conference title. He has 276 goals and 309 assists in 1,088 career games. What his role will be remains to be seen. The Predators signed centre Nick Bonino in free agency and landed centre Kyle Turris in November from Ottawa in a three-way trade. With Ryan Johansen centring the top line, the fourth line is the likeliest spot for Fisher. "I'm here to help the team," Fisher said. "I'm not here for me personally ... I believe I can contribute and play and come back and help this team whatever that role is."